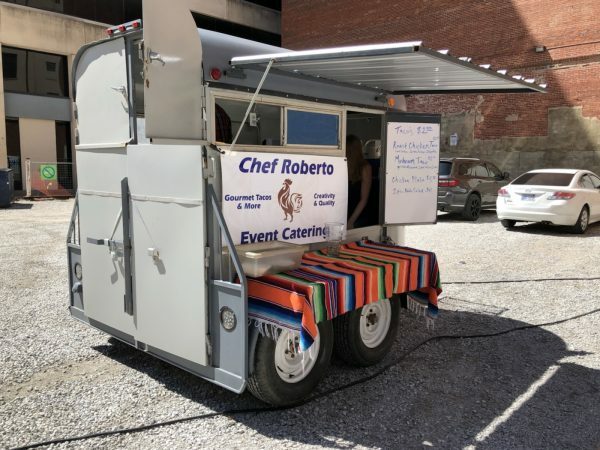 Chef Roberto’s Mobile Taco Bar Review – Wichita By E.B. A recent stop to the ICT Pop-Up Urban Park brought me to a mobile stand owned by Chef Roberto. I first came across his food at Third Place Brewing last year but it was a relatively quick visit. This second time was a great moment to see him in action with his mobile stand with a bigger group of people. A day filled with nice weather meant a good turn out at the Pop-Up park. There were decent lines forming at each of the trucks that day. I stood in line with some people and we all waited our turn to order our food. Once it was my turn to order, there was a lady sitting inside taking orders and payment. I did find it interesting she didn’t write down anybody’s orders. After I ordered my food, I stood to the side of the mobile stand and awaited my food. Later on, I could start hearing some grumbling from people. Once someone’s food was prepared and given to the customer, Chef Roberto would point to another person and ask what they had. This was done over and over and created long waits for customers. One guy wasn’t paying attention and next thing he knew, Chef Roberto was pointing at other people and asking what they ordered so he could make it for them. The guy was not impressed with the process at all. It was very disorganized to say the least and left a few other customers unhappy. It was a huge difference from my original experience. 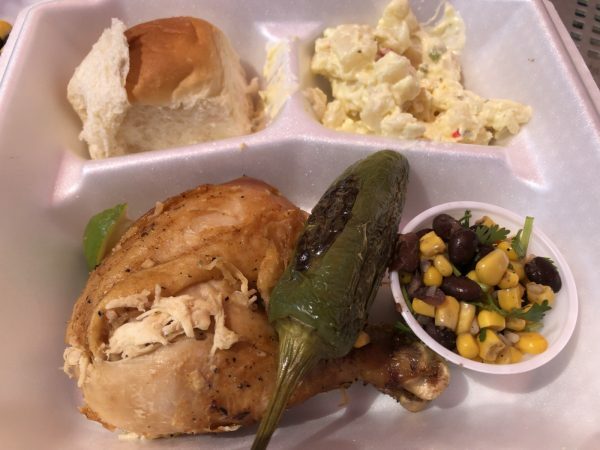 Our order consisted of a roasted chicken taco, a mushroom taco and a chicken plate which consisted of two pieces of chicken, potato salad and roll. The chicken was decent. The outside was a little on the dry side but slowly got better; there wasn’t much in terms of seasoning either. And the tacos were a little underwhelming. The tortillas and chicken were fairly bland. 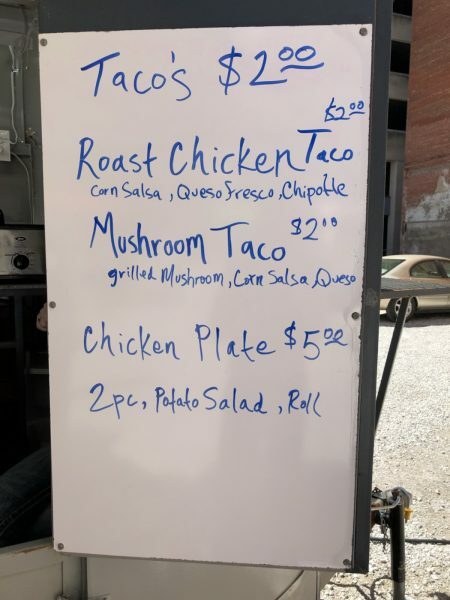 The grilled mushroom tacos weren’t half bad and much more flavorful than the roasted chicken taco. 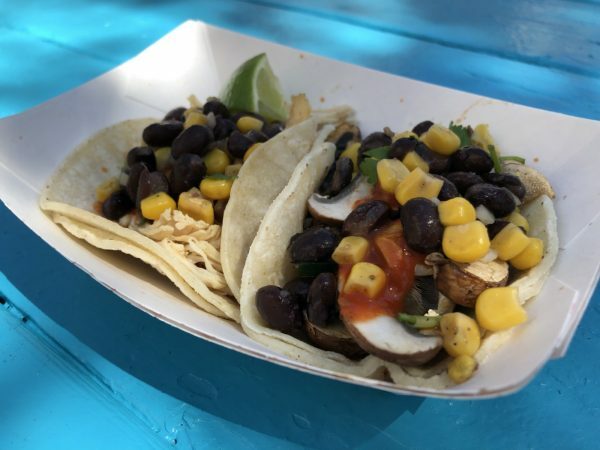 I remember hearing some good things about the tacos from others but this visit fell very flat for us. The big pro to the visit were the prices. They were easily the most affordable option at the park that afternoon but there’s certainly some things that need to be improved upon mainly the order process. My goal is to make it out to the park a little more this summer so that’ll give me a chance to try Chef Roberto again in the future to see if progress can be made.